Click on the cartoon for a better view. You can also see it in the Still Image/Pocket Joke Section, Page #5. To start off the commentary about this 13th cartoon of Still Image/Pocket Joke Page #5, I wasn't suggesting that smarter people should kill anyone less intelligent. Besides, that would also mean that anyone smarter than them would also try to kill them! Actually, it's the not-so-smart people who are more likely to commit murder; some criminals think that problem-solving is so simple that killing will solve all their problems, but they're wrong! Actions have consequences that crooks have to pay for. Besides, murder is when a crook kills an innocent person. As harsh as the message of this cartoon seems, it is ultimately giving very good advice because learning is part of life as Derek Cyannus Jr. says in the image. It's my advice for ignoramuses everywhere... And it's their funeral, too, if their own stupidity gets them killed! Suppose someone didn't want to know that poison is dangerous if you swallow it. You, knowing what poison does, wants to warn that ignorant person about it, but he/she won't listen to your advice & drinks the poison anyway. Then the next thing you know, that person gets sick. You call 911 to get the sick person hospitalized, but the ambulance truck takes too long to reach; so the person dies...because he/she ignored your advice about the poison! See how dangerous stupidity is? Even geniuses can suffer from others' stupidity! 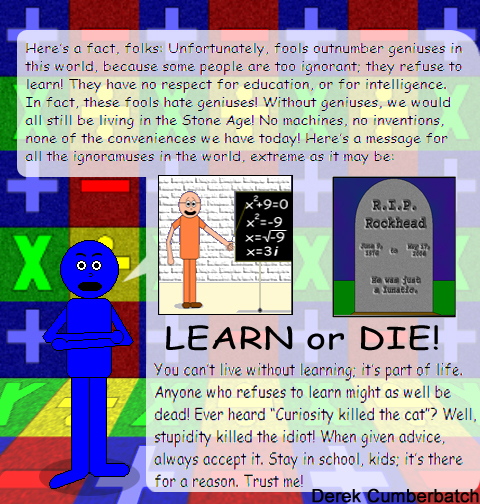 To the right of this final paragraph is the old version of the "Learn Or Die" cartoon; click on it for a better view. This older version was politically incorrect with an image of Burger Meat Food pointing a gun at the viewer; that's why I changed it to an image of a tombstone. The name on the tombstone is Rockhead. That's the name of the deceased villain that used to bully Crayonman AKA Carlton Yoshi Marker in some of my older cartoons. Rockhead died in the Season 4 Finale, hence its title: "Rockhead's Last Stand". You can see how he died by reading the epic, full-length comic strip. This villain used to be a member of the Extraordinares, but he had a bad habit of picking on Carlton. That habit eventually cost him his life. I don't want to give away the whole story, so that's all I'll tell you about it. I'm reserving the old version of this cartoon for the commentary since that image of Burger was a little too offensive, how it was used & all. However, I found a better way to use it in another one of my cartoons, so the drawing didn't go to waste! Anyway, it's better to guide less informed people than to abuse them! Also, do be willing to learn yourself.